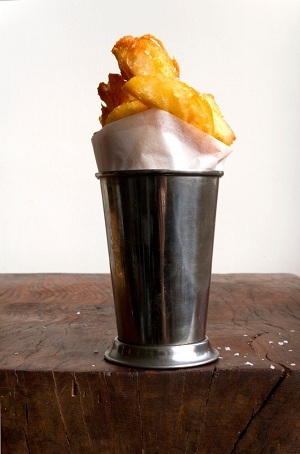 You’ll hurt at Hawksmoor. If you don’t then you’ve failed. It needs saying. One of those basic but necessary announcements, like a restaurant’s preface. Perhaps it should even be a rule? But rules can be broken, disrespected, and ignored. 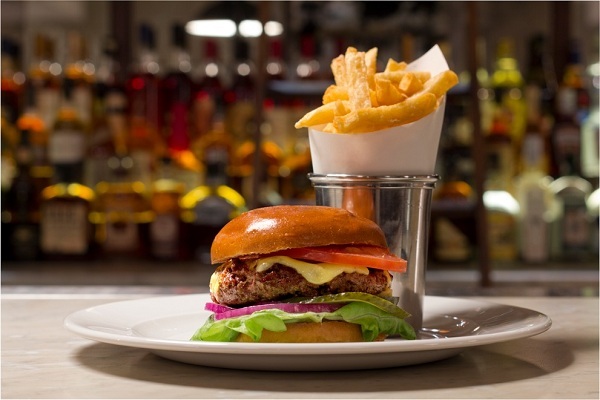 You can’t ignore fact…the reality: you’ll hurt at Hawksmoor. Aching, distressed, belly-burning protein poisoning. It’s the reason the restaurant is always busy across its three locations: Spitalfields, Covent Garden (Seven Dials) and the City (Guildhall). Covetous carnivores in their baggy shirts and lose-fitting trousers have declared Hawksmoor steaks the best in town, and by the looks of the dining room in the recently opened Guildhall, you’d be foolish to disagree. 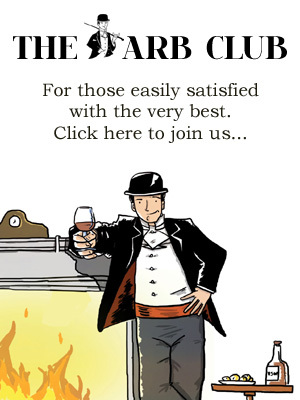 The basement spread is the neanderthal meat cave to happy inhabitants, those who, despite their elegant suited appearance, seem at leisure; blue blood spilling on to fleshly-pressed pleats, beef dripping staining dry-cleaned cotton, and the rosy bone marrow-smeared faces of laughing lawyers. One and all are wrapped up in meaty merriment and the quaffing of wines. That periwinkle medley between a slab of meat and glasses of crimson plonk. It’s at points, and places, such as this, when the outsider (me) is sent to report on events, that the best course of action is to submerge oneself fully in the convivial atmosphere of such a selected location and its inhabitants. And with lauded responsibility, I joined the craving mob, sending the human race back some 30,000 years. At a time when so much is written about meat on the bone, I divert to consider the meat inside. That tissue interior and the glorification of beef marrow. A lesser considered anatomy cut, if prepared correctly, is the greatest taste in the world. Fergus Henderson proved this with his legendary Roast Bone Marrow and Parsley Salad. At Guildhall they tamper a little over-enthusiastically, with liberal lashings of sweet onion on two highly-sawn cuts of bone. It’s a terrible preparation choice pre-meat-main-overload, but I’m one of the dead cow brethren now, delighting in frivolous nourishment and lubricating my lips with the picked, steaming innards of marrow. Having previous glutinous experience from the Seven Dials branch, my father could only look on (as one who knows the foreboding belly restriction that awaited me). With gusto I rushed in and ordered a Porterhouse cut (£12.50/100g). I’m told by our charming waitress Amelia (who reads from a notepad of daily cuts from the kitchen) that the only remaining cut was 800g. Fine, and I ordered sides of beef dripping chips and buttered sprouts and chestnuts to boot. Both were faultless. The meat arrives calescent in its skillet. 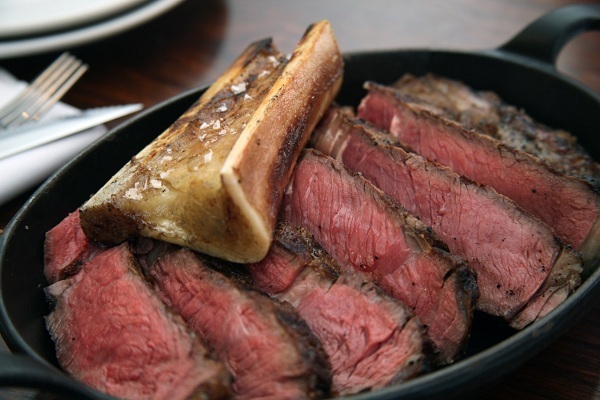 A stripped T-bone is the separation panel between steak and tenderloin. Porterhouse cut is from the short loin at the rear end of the cow. Due to the valued large tenderloin, Porterhouse steaks are a prized cut, and as such, are reflected in the price. It’s seared nicely on the outside so there’s that faint smell of ash and that very thin lamella of blackened beef. Inside, it’s pretty pink. There’s no sauce or flavour shroud required, only a crack of black pepper. I nod in approval and join the happy murmurings of the room. Hawksmoor use Longhorn cattle reared by The Ginger Pig. They are dry-aged for 35-days and cooked on a charcoal grill. The result is a teasing inventory of all the cattle cuts attainable: Bone-in Prime Rib, Porterhouse, Chateaubriand, Fillet, Bone-in Sirloin, Rib-eye, D-Rump (aged 55 days), and Surf ‘n’ Turf (300g Fillet & Half a Lobster). Every angle of the beast is managed and there’s a real highlight – being heralded as the ‘Guildhall Experience’ – in the six course Beef Tasting Menu, featuring Beef Tea, Tongue and Tail Salad, Oysters with Braised Short Rib and Kimchi, Beef Shin Macaroni, and a selection of steaks. You’re enchanted by meat: big, abundant slabs of cow, and a good wine list to boot. A fine accompaniment is the Rosso Braida, ‘Hawksmoor Blend’ 2006. A little chewy to begin with, much better after half-an-hour or so aeration. It’s a winning combination between Barbera (which a Victorian Englishman once declared, “very wholesome”, but on first taste bears “a close resemblance to ink”), and Cabernet Sauvignon and Merlot. And so to dessert. An extra inch or two required from already bloated bellies. Puffing and wheezing I ordered a peanut butter shortbread with salted caramel ice-cream and a Somerset apple brandy. Salted caramel is so on trend right now. If you saw Nigella Lawson on the front cover of Stylist in December then you’ll understand the extreme relationship some of us are having with salted caramel. Desserts are good, mine was sweet; the shortbread slightly burnt but softened by a single scoop of exquisite salted caramel ice cream and drizzled toffee sauce. Desserts are always going to play second fiddle to the meat course, though. Indeed, in some cases, there is an overlap: take Suet Sticky Toffee Pudding. Darn. I should have had that. I shouldn’t have had anything, really. Anything more. I was set to erupt, a performance of meat fireworks bursting through my skin. If only we weren’t downstairs then I could have rolled out. I love the opening of this piece: “You’ll hurt at Hawksmoor. If you don’t then you’ve failed.” Great stuff! This place does amazing steaks!